The research team had to design and build ultra-high vacuum equipment to conduct the experiments. 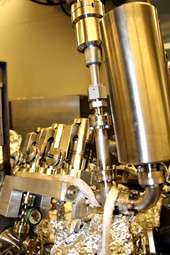 (PhysOrg.com) -- Imagine your car running on an abundant, environmentally friendly fuel generated from the surrounding atmosphere. Sounds like science fiction, but UT Dallas researchers recently published a paper in the journal Nature Materials detailing a breakthrough in understanding how such a fuel  in this case, hydrogen  can be stored in metals. Chopra is part of a collaborative effort among UT Dallas, Washington State University and Brookhaven National Laboratory to find ways to store hydrogen for use as an alternative fuel. Hydrogen has potential for use as an everyday fuel, but the problem of safely storing this highly flammable, colorless gas is a technological hurdle that has kept it from being a viable option. We investigated a certain class of materials called complex metal hydrides (aluminum-based hydrides) in the hope of finding cheaper and more effective means of activating hydrogen, Chopra said. This is the first step in producing many important industrial chemicals that have so far required expensive noble-metal catalysts and thermal activation. Essentially, the process can easily break apart molecular hydrogen and capture the individual atoms, potentially leading to a robust and affordable fuel storage system or a cheap catalyst for important industrial reactions. Chopra discovered that the key to unlocking aluminum's potential is to impregnate its surface with trace amounts of titanium that can catalyze the separation of molecular hydrogen. For use as a fuel-storage device, aluminum could be made to release its store of hydrogen by raising its temperature slightly. This system presents a method for storing and releasing hydrogen at lower temperatures than what is currently available, which is critical for safe day-to-day applications. To perform these experiments, Dr. Jean-Francois Veyan, a research scientist in Chabals lab, greatly assisted Chopra in the design and construction of a sophisticated ultra-high vacuum equipment. Dr. Yves Chabal, Texas Instruments Distinguished University Chair in Nanoelectronics and head of the Universitys Department of Materials Science and Engineering, who oversaw the research program, praised the teams achievements. Hydrogen, which is in abundance all around us, ... alternative fuel ..."
Two major flaws: there is no hydrogen around and it is not a fuel. Hydrogen is an energy-storage material. It has to be created at a very high energy cost from water, natural gas, or another hydrogen-containing compound. dschlink is right on. Although, the toshiba 4s can desalinate thousands of gallons of water an hour and its byproducts are H2 and O2. What I wonder about this technology is how will it be able to scale up considering how dead-careful they had to be to make it in the first place. Only if you want to be obtuse. Hydrogen is there all around us (bound with oxygen and in many other forms). And the definition of fuel is: "Any material that stores energy that can later be extracted to perform mechanical work in a controlled manner"
or "A material such as wood, coal, gas, or oil burned to produce heat or power." Depending on which dictionary entry you wish to use. Hydrogen gas fits those perfectly. What you are thinking is a primary energy source. But a fuel is not necessarily one. That's *theoretical* efficiency. Which isn't quite the same as what's actually possible with modern state of the art (which is, according to your own reference, 50% - 70% tops.) Add to that efficiency losses of converting hydrogen back to electricity (in fuel cells -- current best is somewhere around 60% under reasonable temperature/pressure/portability constraints), and your total round-trip energy transfer efficiency drops to 30% - 40% or so. And in 'number of times you can recharge'. Here's my biggest worry about Hydrogen as a "green" fuel. It leaks far too easily. I'm not sure this is much of a problem unless you store it as pressurized gas. If you store it in metal hydrides then the volume of the entire reservoir-fuelcell-system where the hydrogen is actually in gaseous form (and hence where it could escape from in that form) is very low. If you store it in metal hydrides then the volume of the entire reservoir-fuelcell-system where the hydrogen is actually in gaseous form (and hence where it could escape from in that form) is very low. But then you have hardly any weight advantage over batteries, and you're at a great disadvantage in efficiency. I'm not sure whether a weight advantage over batteries is a crucial factor. Lithium-ion batteries have a specific energy density of up to 250Wh/kg. Although the value for hydrogen storage systems must usually be reduced by 50% because you need to add the weight of the tank and the control systems. Even so it seems that the two can play in the same ballpark. And with hydrogen's advantage in transport, refuel times and number of cycles as opposed to those for batteries it seems that hydrogen is still a real contender. Hydrogen catalysis with oxygen very well to make a safe, non flammable, easy to store and extremely high energy dense material called water. It's the safest hydrogen storage system going and we already have enormous infrastructure to deliver it almost every where.